Early Wednesday morning it was announced that the Padres and Athletics had agree to a deal that would send Padres 1st baseman Yonder Alonso and reliever Marc Rzepczynski to the Oakland Athletics for pitchers Drew Pomeranz and Jose Torres as well as a player to be named later. For the Padres this is both a move to clear salary space as well as to get younger overall with added pitching depth. For the Athletics this represents a move to strengthen two areas of weakness, in the bullpen and first base. This is one of those trades where both teams truly benefit. Here are three takeaways on the deal. Going into the offseason, there was a lot of questions for the Padres all around the diamond. With this trade, the Padres have apparently answered one of those questions. 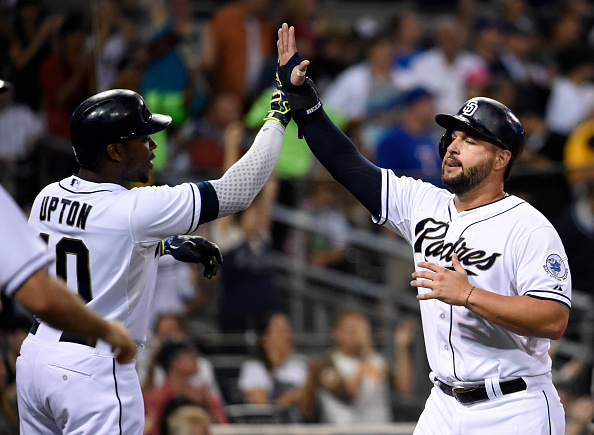 There was a lot of uncertainty about who would play first base for the Padres in 2016, with both Yonder Alonso and Wil Myers both getting a good deal of playing time at the position while the other one was injured. With this trade, it appears the Padres are ready to roll with Wil Myers as their starting first baseman in 2016. Obviously things could still change over the next several months, but for now that appears to be the plan going forward. Not only did the Padres trade a player they didn’t really view as a huge part of the team’s future, but they also saved a good deal of money in the process. While Alonso was set to make $2.5 million next season, with Marc Rzepczynski also set to make $3 million, Drew Pomeranz is only projected to make $1.3 million in 2016. With this deal the Padres saved over $4 million, and got two players they really liked, in Pomeranz and Jose Torres in return for two truly expendable players. The players will likely take that money saved and use it to upgrade the roster in other areas. This trade also made a lot of sense for the Oakland Athletics. While they did have to spend a little more money to get Alonso and Rzepcynski, they do benefit by filing two areas of need. The Athletics have one of the worst bullpens in baseball last season, and Rzep will be a good upgrade for them. The Athletics also appear unlikely to bring Ike Davis back for next season, so Yonder Alonso will fill his spot in the lineup at a cheaper price. Alonso will likely slot in as somewhat of a platoon partner with Mark Canha for a cheaper price and with some potential for a bounce back. This trade really makes sense for both teams. Previous Previous post: Casey’s Statistical Follow-up Series: Who should hit second?